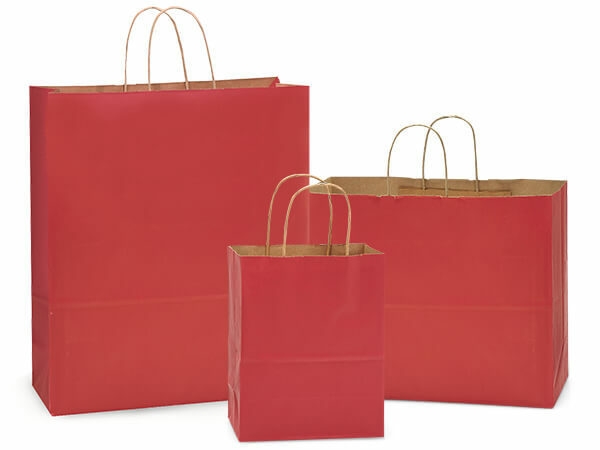 Christmas Red Kraft Paper Shopping Bag Assortment contains 300 Bags Total: 150 Cub (8" x 4-3/4" x 10-1/4"), 100 Vogue (16" x 6" x 12") & 50 Queen (16" x 6" x 19") bags. Made from 100% recycled natural kraft tinted paper. Green Way ® Eco-Friendly Packaging. Made in the USA. Call our Custom Print Dept. to personalize your shopping bags with a store name or logo at 1-800-547-9727 ext. 4.